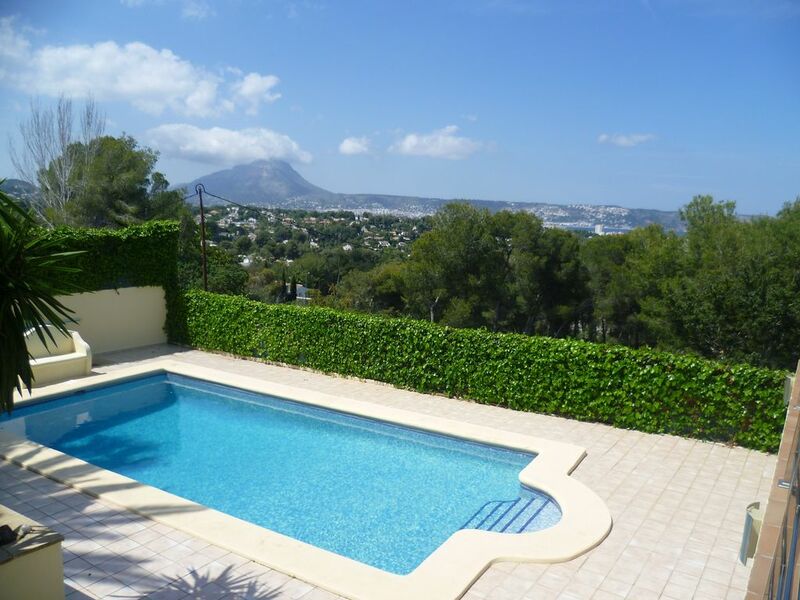 A truly exceptional modern Villa with breathtaking views of the bay of Javea and Montgo mountain. Beautifully landscaped gardens,large terrace overlooking the private pool just perfect to watch the sun set on those sultry summer evenings. For the sporty there is a tennis court. The accommodation is pure luxury, an open plan lounge with a feature central fire place plus surround sound home entertainment system. Hot and cold air-con throughout so no sleepless nights,for the chefs amongst you a high tech modern kitchen. If you want it all this holiday then this is it,you will not want to go home! Ipod docking station. WIFI. TV. Everething we wanted was there; the views,relaxition,comfort,privacy,beatifull house.We did enjoy staying in villa.We had such wonderfull time.We will come back to this villa again for sure. We had 10 wonderful days here in July 2017. The villa is very spacious and the layout was perfect for our party of 8. The pool and grounds were every bit as good as the villa itself and the views from the balcony at sunset were breath taking ! The local area is very peaceful and relaxing. Javea is only a very short drive away with both sandy (Arenal beach) and shingle beaches. There are plenty of restaurants with enough to cater for all tastes. There are also some more "off the track" beaches which are well worth a visit, we managed Playa Grandella which was amazing. The local manager Jane was always on hand and very helpful. We certainly hope to be returning and would recommend to our friends. Thank you Guy. So pleased you all enjoyed your stay. Hope to welcome you back next year! The villa is stunning, beautifully laid out, all very comfortable and clean. There are great views of the sea, which is 10 minutes drive away, and of Montgo mountain. There's plenty of attractive space inside and out. The tennis court is nice, though a slight drop / groove in one part. But we enjoyed playing tennis every day (apart from the day it rained heavily for 24 hours - good that there's good space inside as well as outside!). It's a lovely area too - Javea has a very nice sandy beach (Arenal), and there are several smaller non-sandy beaches which are good for snorkelling. It's also possible to get to a rocky bit for good snorkelling off Arenal, at the end of the beach closest to the villa. The local manager, Jane, was very helpful, we had a lovely holiday. We had a fantastic two weeks here in July 2015. The villa was first class in every respect, clean and well maintained. The views were magnificent and the pool beautiful. One or two minor hitches were immediately sorted out by the very friendly and helpful local manager and we would certainly return another time and also recommend it to our friends. A great holiday. Diese Finca hat insgesamt eine gute Aufteilung und liegt in einer sehr guten Lage. Das Haus ist aber etwas in die Jahre gekommen und teilweise aussen, sowie innen in den Bädern wäre eine Renovierung mal wieder fällig. Erstaunlich ist zudem, dass bei einem solchen Anwesen an Kleinigkeiten des täglichen Bedarfes gespart wurde offensichtlich. Hiermit meine ich z.B. die Kaffeemaschine, aber auch Besteck und Geschirr. Die Kaffeemaschine ist uralt und hat auch bei Neuanschaffung wohl nicht mehr wie 10 € gekostet. Bei voller Belegung wird es zudem mit dem vorhandenen, teilweise sehr altem Besteck und Geschirr eng. Bei unserer Ankunft war das Haus leider unzulänglich gereinigt. Nachdem wir dies reklamiert hatten, wurde nochmals alles sauber gemacht. Das war dann in Ordnung, hätte ich aber eigentlich von Anfang an erwartet. Zudem waren wir es von unseren Aufenthalten in den Jahren zuvor aus allen Häusern gewohnt, dass nach 1 Woche im Haus nochmals geputzt wird und Bettwäsche/Handtücher gewechselt werden. Dies war hier nicht der Fall. Im Großen und Ganzen haben wir uns aber wohl gefühlt und unsere Betreuerin vor Ort Jane war stets sehr bemüht, alle angezeigten Mängel zeitnah zu beheben. Javea is located half-way between the two regional cities of Alicante & Valencia,nestling on a coastal peninsula with 25 km of beaches and coves.